Scuptamold is a paper-mache-like material. Just add water and you get a paste that is extremely easy to work with. Today was the first time I worked with Scuptamold to fill in holes and cracks around the retaining wall near Tiersteintunnel. I practiced a bit applying the Scuptamold with an artist's spatula, and experimented with the relative amounts of water and Scuptamold, and the resulting effects. Eventually, I finished up the hillside not yet covered in hardshell. The stark white could probably be toned down by mixing in some tempera powder paint. I really liked working with Scuptamold. The drying time is quite a bit longer than my plaster-vermiculite mix. Working with a small spatula allows for very good control of where the material goes. 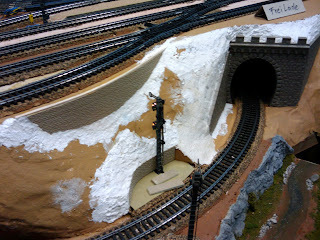 Next, I turned my attention to the cracks between the tree bark "rocks" around the south portal of Hochwaldtunnel. ... Yeah, that is really white. For filling in the cracks I used fairly little water to get a more solid mixture (about the consistency of not quite fresh Play-Do), that allows for modeling sharp edges and crevices of rocks. I also rebuilt stub-ended staging (again). The faulty turnout was replaced with a spare double-slip. I really don't feel like buying any more M-track turnouts, so when making repairs I just use extra pieces that I have lying around. While testing I accidentaly ran the test engine off the unconnected track of the double-slip. It got caught by the "let's not fall on the floor" fence I have installed in various places around staging, so nothing bad happend, though I obviously need to pay better attention when running trains out of those tracks. 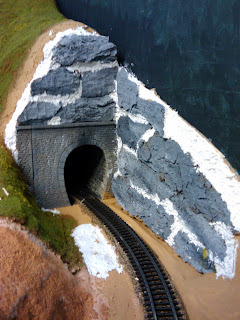 BTW, I use a lot of sculptamold, but don't like the pebbly / cottage cheese finish when I'm doing large, flat areas. 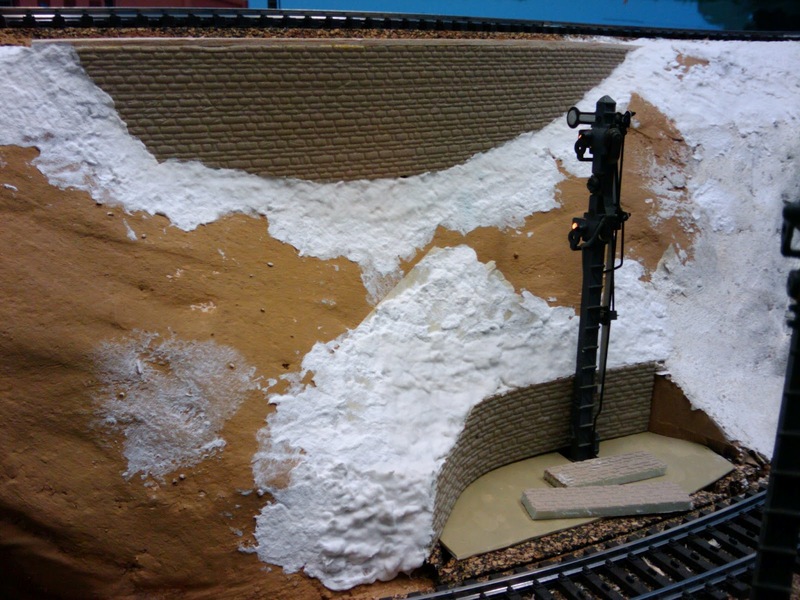 I usually wait an hour or two until it stops being soft, and then sand it down with a wet paper towel or sponge to cut down the high spots and get the plaster filling in the gaps. I'll also use spackle over the top of the sculptamold as a finish coat, again smoothing it out after drying. In this particular case, the cottage cheese finish is actually a good thing, since I'd expect that hill to be pretty uneven. Now that I look at its current state, I think I'll go back and add some more small rock outcroppings to the slope above the signal that can peak out from under the grass. Spackle? Hmmm, ... have to try that some time.